The colonial house at 70 Arrowhead Way has seasonal views of Scott’s Cove and Long Island Sound. 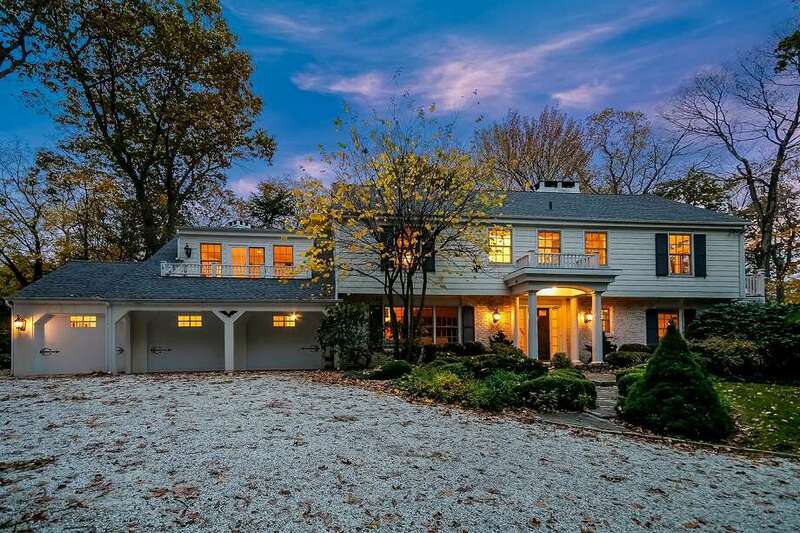 DARIEN — Turn into the long driveway at 70 Arrowhead Way and the feeling is one of inhabiting two vastly different yet equally beautiful geographic regions simultaneously. The tree-lined crushed stone driveway, bordered on both sides by split rail fencing, resembles the woods of Vermont, but the proximity to Long Island Sound and the seasonal views of Scott’s Cove evokes thoughts of the eastern coast of New Hampshire, Rhode Island, or well, Connecticut. Either way — ocean or woods, it’s New England and all the beauty of the landscape that goes with it. This house is positioned on a 1.13-acre level property in a very secluded setting in the private Tokeneke Association of Darien, which is open only to residents and their invited guests. The Tokeneke Association has its own constables who patrol the streets, making it safe for residents to walk and bike through the streets. The house is close to downtown Darien and three Metro-North train stations. It is also walking distance to the local elementary school, Tokeneke Park, and Long Island Sound. Watch the seasons change from the large picture windows, sliding glass doors throughout the home, and the two balconies — one in the master bedroom suite and the other in the bonus room over the attached three-car garage. “Every season is gorgeous,” the co-listing agents said. The red brick and white cedar shingle house was built in 1961, and for that time period it was given a generous 4,217 square feet of living space that still works today. It has five bedrooms and the large bonus room, which is currently used as an art studio, could be converted into a sixth bedroom, if necessary. As it is this room would make a great in-law or au pair suite. It has two walk-in closets and French doors to the balcony. Unlike most houses, which only have one family room, this house has two. One is more like a formal living room and the other is a more casual space that could also be a solarium because of the amounts of natural light that it gets through its many windows. Both of these family rooms have a wood-burning fireplace, vaulted ceiling, and doors to the large flagstone patio and backyard. The more casual family room has wood paneled walls and a ceramic tile floor. The dining room also has sliding doors to the same patio, and the eat-in kitchen opens up to one of the family rooms. These interconnected rooms and access to the patio and yard make this house ideal for indoor and outdoor living and entertaining. There is a “nice party flow” to the house and the kitchen has two dishwashers, which come in handy when entertaining. The kitchen also features a hardwood floor, a center island topped in granite, and stainless steel appliances including a Sub-Zero refrigerator. Also on the main living level there is a sitting room to the left of the sizable entrance foyer. This room has a ceramic tile floor in a honeycomb pattern. To the right of the foyer there is an office, which has a fireplace. On the second floor, the master suite also has beautiful water views from its balcony. The master bath features a marble floor, double marble vanity, shower, and soaking tub. According to the listing agents, this house is a “tremendous value,” especially considering its neighborhood, proximity to the water, privacy, and yet its convenience to local amenities. The closest Metro North train station on the New Haven line, is downtown Darien, just 1.08 miles away. But two other train stations, both on the New Haven line as well — are also close by. The Rowayton station is only 1.4 miles away and the Noroton Heights station is 1.8 miles away. For more information or to make an appointment to see the house contact Nellie Snell and Bridget Sullivan of Al Filippone Associates/William Raveis Real Estate, Snell at 203-979-9149 or nellies@afahomes.com, and Sullivan at 203-644-0107 or bridgets@afahomes.com.